Yee-Haw Industries is a Knoxville, TN printer that uses salvaged and antique equipment to create unique folk-art looking wood-cut prints. They’ve created posters for such music acts as Steve Earle, Trey Anastasio and Lucinda Williams, as well as created advertising art for MTV2, the Cartoon Network and even the Wall Street Journal. Recently ad agency Arnold Worldwide hired Yee-Haw Industries to create a series of patriotic-themed vintage-looking posters for Jack Daniel’s. The process to carve the elements for each of the 10 posters took 3 days. Thankfully, Arnold shot a short documentary showing the detailed process and artistry of the carvers and printers of the print shop. It’s magical watching the artists create the carved elements and then manually print the posters by hand one-by-one. If you’re a fan of letterpress printing, there are overrun prints of the Jack Daniel’s posters available in Yee-Haw’s Etsy store (while they last). Hopefully I can grab one, but I also have my eye on this Banjo Picking Beaver poster. 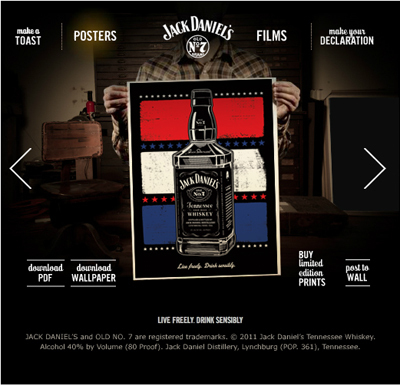 For Jack Daniel’s fans on Facebook there’s no carving or dirty-work involved (or banjo players), they can make a personalized virtual version of the posters and share them on their Facebook profile.